Little “B” has started to show an interest in dolls. She carries them around and puts bottles in their mouths. 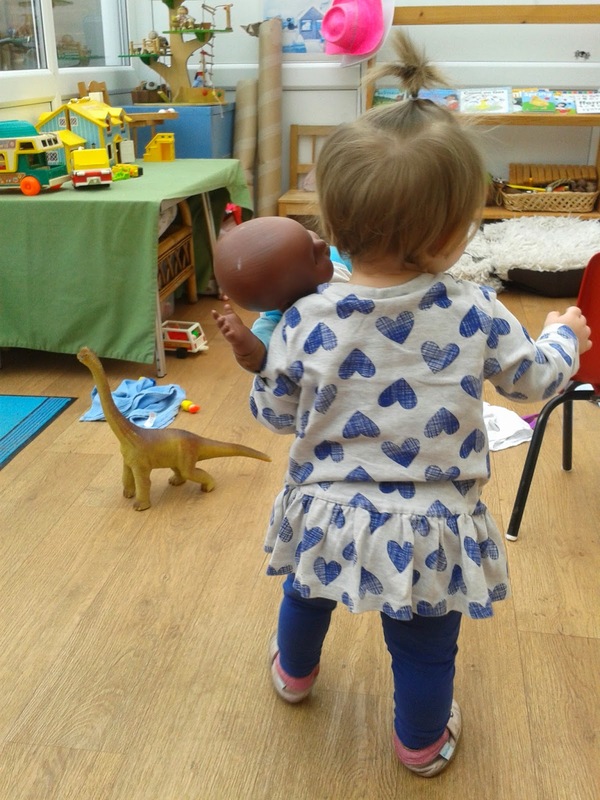 She loves babies and when we are at Toddler group, she gravitates towards the babies in the room and gives them cuddles and kisses. Today she found one of our dolls and carried her around the room. She held her really carefully. She was upright and her head was on her shoulder. She cuddled her. I watched her as she took the doll to a chair. She carefully lay her down and walked back round to the back of the chair. I was not sure what she was going to do. To my surprise she decided to use the chair as a buggy for her doll. 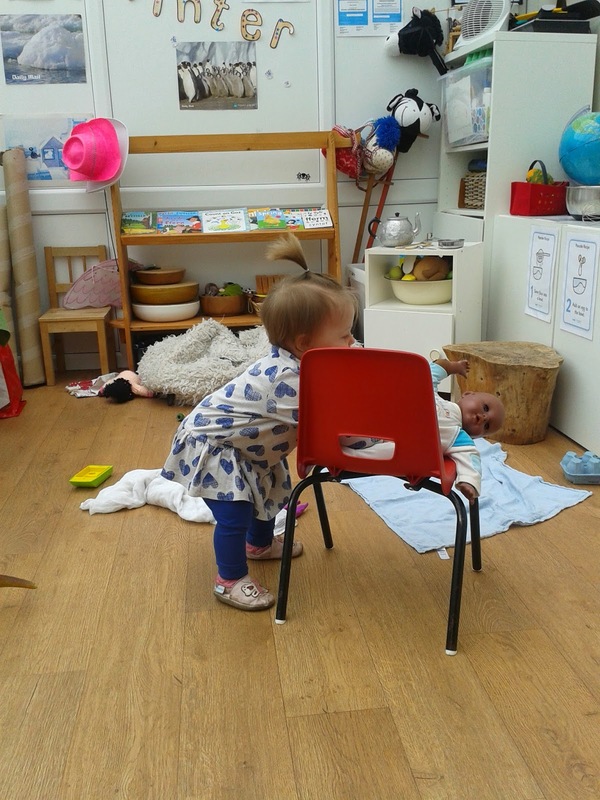 She pushed the chair across the floor with her baby rested on the seat. It was lovely to watch. My dolls buggies broke and I threw them out. I think I will need to invest in another one soon. Gradually able to engage in pretend play with toys (supports child to understand their own thinking may be different from others). 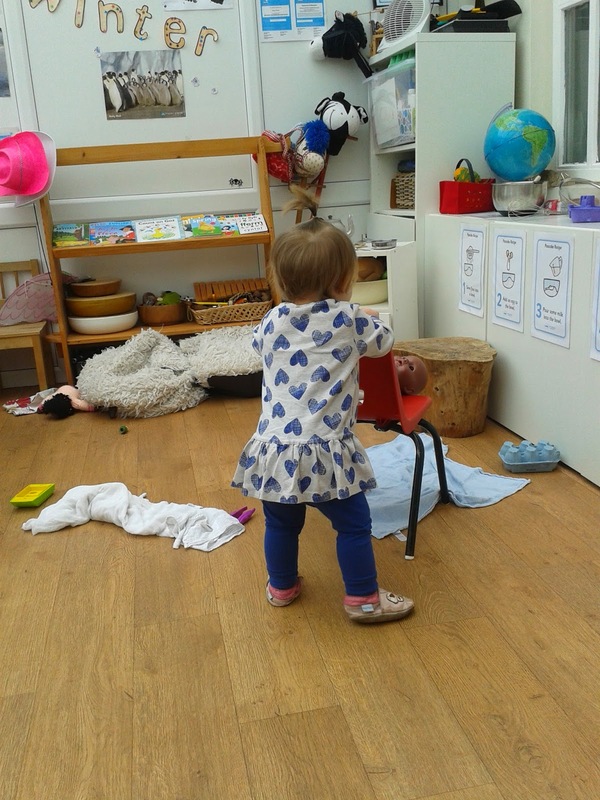 This observation was noted to show how Little “B” observes what the adults around her are doing and then recreates it in her play. I will offer more dolls and accessories for her to use and add some shoe boxes and fabric scraps for her so that she can make beds for them. I will also look out for a dolls buggy to buy or borrow. Little “B” was motivated by her own interest and this play was self initiated. She transferred knowledge she had about babies to her doll play. She was engaged and involved in this and had a set purpose to her play.